INDIA VIX at 14.10 not much drop. 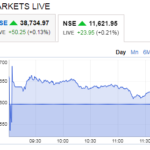 Nifty also has not moved much. Check your traders and book profits now. If entered Strategy 1, of my conservative options online course 10 days before. Profit should be more than 2%. 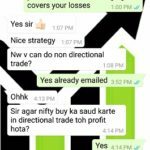 This is good enough tension free trading and profits. Axis Bank Looking Strong now you can do the Stock Option Strategy in Axis Bank Today as per the course. The above email was sent to my subscribers on 21-October-2016 at 11:37 AM. 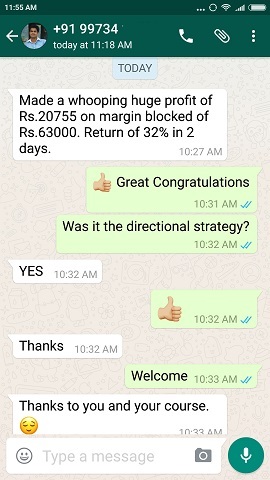 Within minutes I got a WhatsApp testimonial from my client who booked profit of 2% in 20 days on his trade. Those who think this course has value or not here is proof. 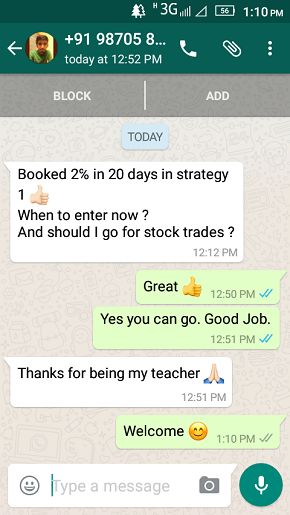 Within minutes of my email sent to book profits to my paid clients I got a WhatsApp testimonial from a novice trader who kept losing money before doing my course, making 2% profit in 20 days. 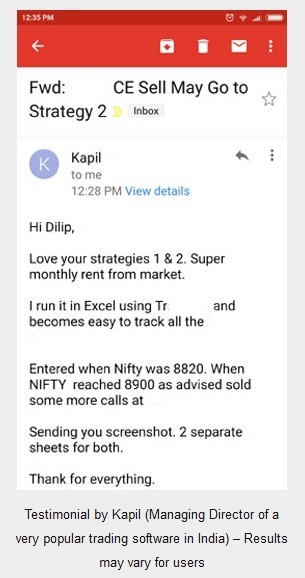 I am sure since he took the course last month he must have traded with just the minimum capital required so his profit must be Rs.1800/- in 20 days. He paid Rs.6000/- for the course. So how long does it will take him to recover the course fee? 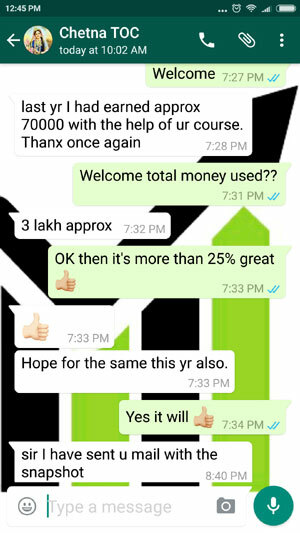 Just 40 days more, or full course fee recovered in 2 months or less. Less for those who can trade with more money. Then for the rest of their life they can keep making money. 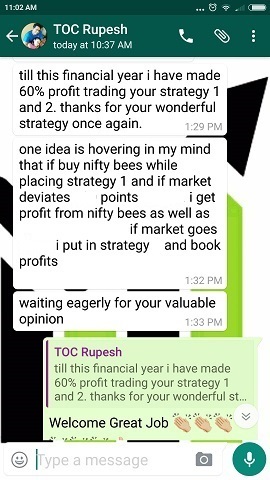 Yes these strategies make money for life because they are based on options logic rather than that useless speculations that Nifty will go up so buy a call or Nifty will go down so buy a Put. All those people lose lots of money still not willing to invest in knowledge. Why did your parents sent you to school? To get knowledge and get a good job. If speculations in trading made money then no one would have sent their children to school only given them 1 lakh to trade and make money. They know very well that it will not happen so send their kids to school. In fact you must be also sending your kids to school for the same reason. But its strange you yourself believe speculations can make money in stock markets. Sorry stock markets do not care for your speculative trades. Every business gives money to people with knowledge. 🙂 Which I think is the right thing. Winners invest in knowledge and make money, losers keep speculating and keep losing money. If you are willing to learn and invest in proper knowledge of trading options you are welcome to my course. If you still believe it is speculations that can keep making money – bye. That dream day never comes even for experienced traders. It feels really nice to keep getting these thank you messages. Please keep them sending.